Enjoy the bright and cheery decor in this oceanfront vacation home that celebrates the kite flying capital of the world… Lincoln City of course. This lovely unit provides the convenience of the first floor with great views and the privacy of an end unit. The private hot tub is a wonderful addition to this special vacation destination. Flying Kites features a great living room setup with a sofa/chaise lounge combination and a plasma TV above the lovely river rock gas fireplace. Large dining table provides plenty of room for 6 just off the beautiful kitchen with granite counters and stainless steel appliances. The master suite has a lovely view of the ocean and a second bedroom with twins is perfect for kids or adults. 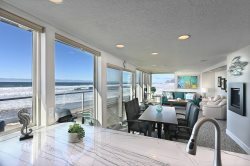 Whether or not you plan on Flying Kites during your stay in Lincoln City, this is an ideal place to spend your vacation. We love it - we have been there twice and will likely come again. Will be back very soon! Perfect location to everything! Loved the property. Wonderful experience. We will definitely be back.